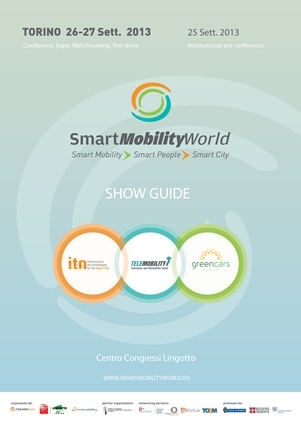 With Smart Mobility World, Turin confirms its position as the capital of intelligent and green mobility. With over 3.000 certified professional operators, 148 sponsors, partners and exhibitors, 230 speakers and 28 conferences. These numbers represent the success of the 2013 edition of Smart Mobility World, organized by ClickutilityTeam, GL events Italia-Lingotto Fiere and Innovability, with the support of Turin Chamber of commerce, which was held at the Lingotto Conference Center in Turin, where they proclaimed it the main initiative dedicated to the entire smart mobility industry. The test drives of green cars – more than 600 of them – were particularly appreciated and held on the Lingotto historical racetrack. Smart Mobility World also hosted the Brokerage Event organized by Turin Chamber of commerce. A significant number of people registered: 80 partecipants out of 240 meetings. The results of the second edition of TOSM – Smart Mobility, Logistics, Automotive, a networking event regarding the supply and demand of ICT technology, were also extremely positive, and always promoted by Turin Chamber of commerce and Industrial Union. The final outcome was 270 B2B meetings between Piedmont companies and national and international buyers.